2/18/2009Share this story on Facebook! 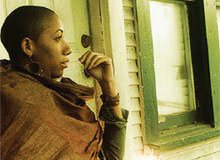 Sunni Patterson will perform at Ithaca College on Monday, February 23. "Last year was the 40th anniversary of Dr. Martin Luther King, Jr.'s assassination and we designed the series as a way both to open up critical retrospectives on his own life and struggles and also to engage some of the themes that were central to this work, including theologies of liberation, civil disobedience, and resistance to oppression," says politics professor Asma Barlas of the CSCRE. "I believe Sunni's performance will touch on this last theme." "Sacred Psalms: Words and Works of Resistance, Love, Struggle, and Victory" is the title of her performance. Don't miss it!